Our cycle tours take you through a variety of locations and environments - boardwalks by the sea, quiet lagoons and shady lanes. Rabbit Island has beaches and wide sandy paths as well as quiet cycling through the trees - a tranquil spot to head for and only 10 minutes from Mapua by ferry ride. The Cycle Trail offers plenty of quiet biking on back roads and beyond the Cycle Trail itself the region offers a peaceful biking experience. A multi-day tour gives you the opportunity to explore some of the region's excellent wineries at a leisurely pace. We are so lucky to have this beautiful region to share with you. 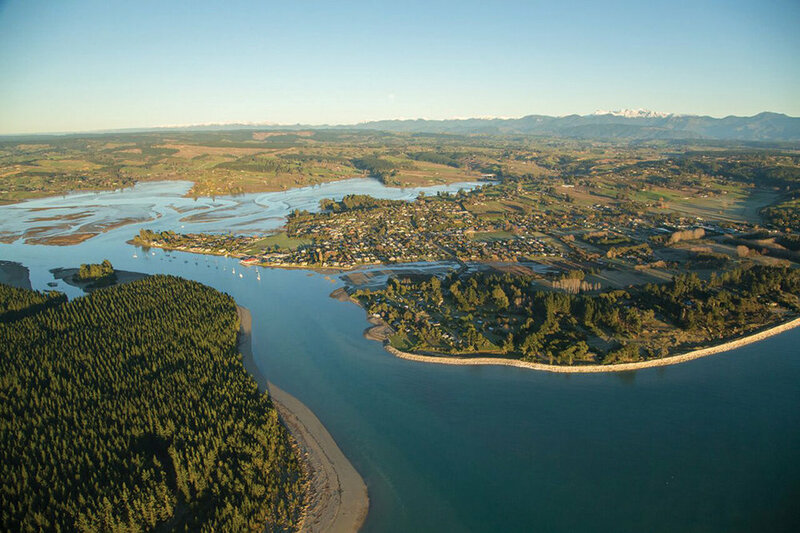 Mapua sits on the Waimea Estuary and the village itself is on The Great Taste Trail. Choose from a range of our Great Taste Trail tours that cater for all tastes and interests, a great way to really get a feel for this beautiful region and, with our recommendations, find some hidden gems off the beaten track too. Our tours can also blend with a trip into The Abel Tasman National Park or other local activities. We continually watch for what is new and what changes in the area so we can offer our guests the best experiences. Our suggestions are based on what we believe to be the best, not just what happens to be here. We offer a range of carefully designed Great Taste Trail multi-day tours, or if you want something a bit more special or different, we can offer a bespoke tour which will incorporate your requests. Our bespoke tours can also include non-cycling days such as a cook school, vehicle based guided day tours and of course a range of options to enjoy the Abel Tasman National Park, Golden Bay or Marlborough Sounds. We also offer our ‘Explore More’ cycle experiences that can be incorporated into a Great Taste Trail Cycle tour, or form a complete Gravel Tour. We have carefully selected gravel routes ( a mix of sealed and unsealed back roads) that take you to beautiful locations that are not on the cycle trail. We offer cycle tours to suit all abilities and budgets. It doesn’t matter if you want to cycle 20km or 200km per day; you decide, we provide. When we know the type of cycling holiday you enjoy, we will design an itinerary to suit you or you can choose one that we have already designed and is ready to ride. We believe that this region has so much to offer all types of cyclists and we will use our detailed knowledge of the area to provide you with the best routes. If cycling from latte to latte is your idea of an idyllic route, we know just the places. If challenging hilly routes are more your thing we can provide those too. What’s included: Our multi day tours include, bike and helmet hire, pannier day bags, hi-viz vests, maps, accommodation and luggage transfer. We will book you into the type of accommodation which suits your budget. Our tours are categorised as Standard, Premium, Premium Plus and Exclusive Luxury. They are based on the type of accommodation as well as what is included in the price. Each tour can have extra days or nights added (or shortened if need be). All of our itineraries are clear about what you will enjoy, so no hidden extras or exclusions when you arrive. Some of the options that are available include: Airport pick up and drop offs. All our tours can be self-guided, guided or vehicle supported. Other activities in the area (eg; kayaking, walking and/or boat tours in the Abel Tasman National Park, wine tasting close to the trail or heli-tour options) can easily be incorporated into any itinerary. Take a look at our tour details to see what other options are available. If you would prefer to arrange your own accommodation, we are happy to provide all other aspects of the tour.